Chili con carne is the icon Tex-Mex dish in the US. It is a dish that is considered so comforting that many crave and yearn for it often. It is one of those unique addictive dishes that keep you going back for more. 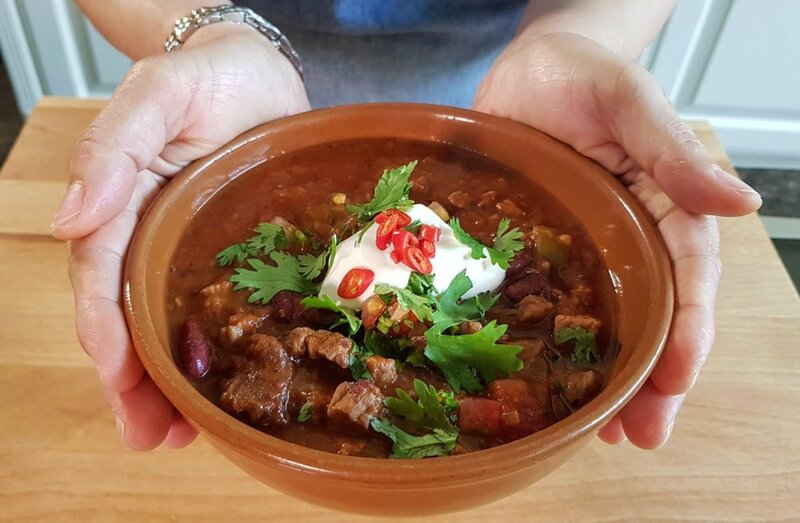 When I had my delicatessen in London, chili con carne was my best-selling food, no matter how much I cooked of it, the pot was gone by the end of the afternoon. It is truly a winning, simple, mouth-watering and hearty dish, that is the perfect option when feeding a crowd. It is easy to prepare, scrummy and is very cost effective especially when you increase the amount of beans in it. Hot and spicy is the traditional version, but hay that is only for the strong at heart. One can adjust the heat and spices to their liking and enjoy it topped with salsa pico di gallo, sour cream and guacamole. You can serve it accompanied with steamed rice or with roast sweet potatoes (as in my vegetarian chili recipe). My favourite way of enjoying it, is with plenty of ripped crusty country bread and off course extra chilies. * Sauté the onions in olive oil using a cast iron pot and stir until translucent. * Add the crushed garlic and sauté until the aroma is released. * Add the cubed beef, all the spices and the sugar, sauté until browned. * Add the tomato paste, tinned tomatoes, chipotle peppers, chopped bell peppers and 1 ½ of the tinned beans then puree the remaining half of the beans and add it to the pot. * For a super low-calorie option of this dish, use minced turkey breast. * For a super-fast dish use minced beef. * Don’t add too much water as the beef will release its juices. * You can use any variety of beans that are available in your pantry. * If using fresh ripe tomatoes, peel, deseed and chop 750 grams of it and increase the tomato paste by 1 tablespoon. Per Serving: 519 Calories; 14g Fat (24.5% calories from fat); 39g Protein; 61g Carbohydrate; 15g Dietary Fibre; 62mg Cholesterol; 769mg Sodium.